This is what Lily, the membership manager of a small Library Association wanted to accomplish. After doing some research online, she felt lost. All the articles she came across advised her to integrate Wordpress plugins, create code, or hire someone who knew how to build a membership site. Unfortunately she didn’t have the know-how or the budget to do any of those things. Luckily, I happened to meet Lily in an online forum and showed her the easiest way to create one all by herself. In just a weekend she had an amazing membership site setup for her association and in just a few days, two new people had registered and paid for a membership online. 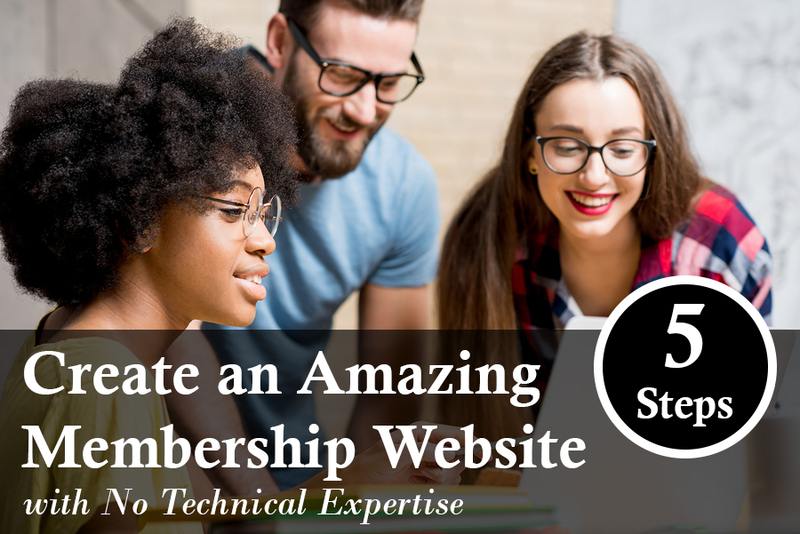 The most successful membership organizations use their website to help grow, engage, and retain their members, while saving time and money on administrative tasks. act as the contact person when members have questions, or need help. A membership site does all the above and more, online. That’s because members can enter information (like contact details or payments) into it, and then the site talks with a contact database to update their information automatically. Register new members and event attendees online. Payments and contact details are instantly and automatically processed through a contact database. Automatically email invoices, event reminders, renewal reminders, and overdue payments warnings. Update a robust, searchable contact database. Send out emails and newsletters to different groups of members. Grant instant access to member-only resources once a member pays. On top of all this, if you include the right pages and information on your website, it can actually help you grow members by itself. I’ll explain more of this in later steps, but overall, a good site can save you about 20 hours a week or more in administrative work. That’s because it runs like a machine in the background, processing and updating information while you can focus on other tasks, like creating value for your members and running events. If you’re ready to setup a site for your organization with all the above features, here are the five steps that will guarantee your success. Before I explain how to build a site by yourself, some prep work needs to be completed ahead of time. The organizations that do this prep work end up saving hours of time in the setup stage. The first thing you need to prepare is your membership model. A membership model is simply how and why people join your organization and what they get in return. I’ve seen organizations with unclear models waste their time creating website features no one uses and pages no one clicks on. What value do members get for joining? Usually paid memberships get access to monthly newsletters, member directories, online courses, workshops, industry reports, networking events, and discounts on conferences and other events or merchandise. If you know the exact reason members join your organization, you should try your best to offer that value online. What are the different membership levels? Free, Individual, Group, Student, and Professional levels are some of the most common levels I’ve seen. 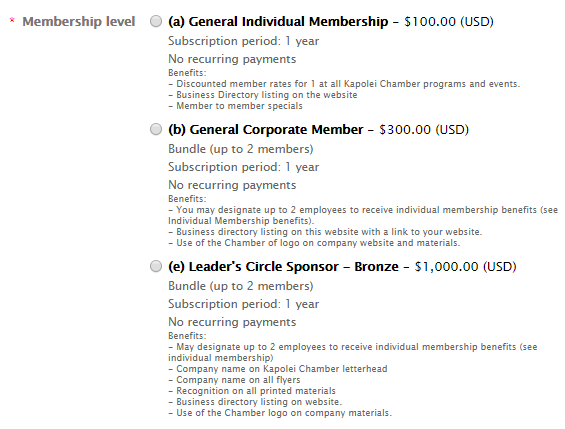 Take a look at some of the membership levels of The Kapole Chamber of Commerce below. You can see how they’ve clearly laid out their pricing structure, and what each level gets access to. What events do you have coming up? 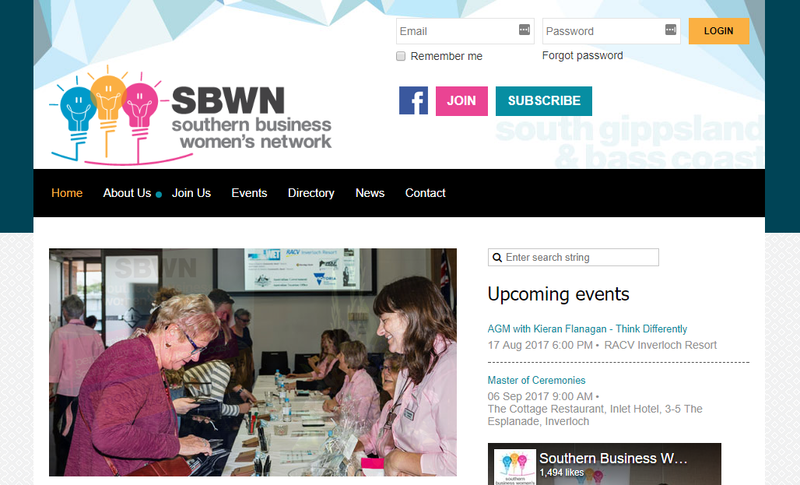 If you have a set calendar of events for the rest of the year, you can enter them into your new website all at once. The advantage of this is two-fold. One, it saves you time from constantly going into your website to add events later on. Two, visitors to your website can see your whole calendar of events and sign up far in advance, increasing your cash flow upfront. If you’ve got clear answers to the above questions, you’ll have a good guide to the types of pages and features you’ll need to implement on your website. There’s only one thing more you need to prepare to drastically reduce the setup time of your new website. One of the biggest advantages of a membership site is that it connects with your contact database to automate payments, registrations, and other information. While it can be a pain, taking an hour or two to clean up your current contact database can save you twice the time afterwards (I’ve seen Excel used most often). Organizations that don’t do this end up spending hours removing duplicate entries and double-checking dates and payments after their website and database are connected. Standardize dates for join date, renewal date, etc. Standardize names for all membership levels. If you are using excel, here’s a sample of how your cleaned-up spreadsheet should be laid out. 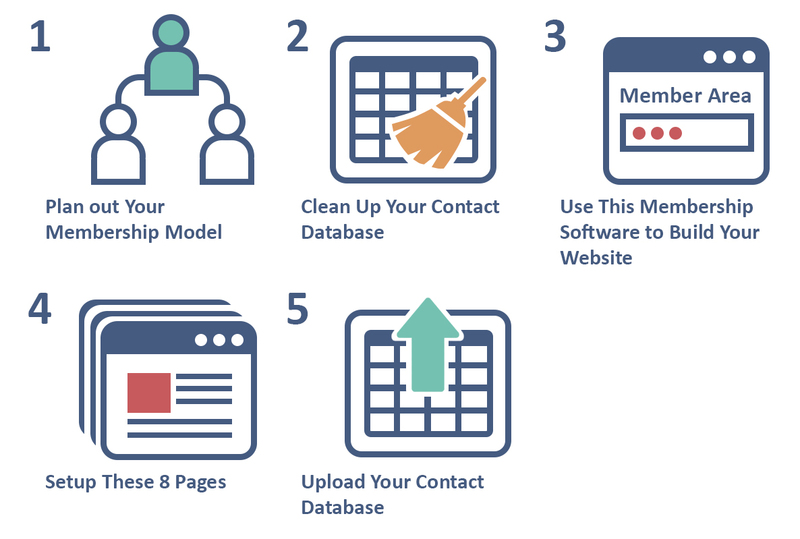 Once you’ve got a well-thought out membership model and a cleaned up contact database, you’re ready to create your membership site, which brings us to the next step. While there are many paths you can take to build your site (you can build a website from scratch, hire a freelancer, integrate membership-plugins for wordpress, etc. ), my recommendation is to use something called membership management software — an inexpensive (and sometimes free) software that exists to assist those who don’t have any technical expertise, but still want an amazing, robust membership site. Once you select a membership management software, it can create a pre-populated one for you in minutes. Membership management software is a type of software built to save membership organizations time and money when it comes to member management and administrative work. On one hand, it will allow you to create a professionally designed membership site in a matter of minutes — complete with member-only access pages, an events calendar, a join us page, member directories, and more. The best part is that anyone without any technical expertise can use it, because of its easy-to-use, drag-and-drop tools. In the GIF below, I'm using Wild Apricot's membership management software to drag and drop a membership application onto the web page I'm editing. Any other feature you'd like to include such as a member directory, slideshow, or subscription form can be added in the same way. The #1 membership management software on the market, used by over 20,000 membership organizations is called Wild Apricot. The best part is that you can try it for free. You can start your free, 30-day trial of Wild Apricot here. Wild Apricot also has a free, basic plan which you can use indefinitely. More details on their free plan are here. Once you've started your free trial of Wild Apricot (or the provider of your choice), there are a number of pages you’ll need to setup that are proven to attract and convert new members online. I talk about which pages those are in the next section. Your organization’s purpose, mission, and values: Visitors want to know these things to see if they align with their personal values and needs before they will consider becoming a member. Access to specialized information and resources: This is your chance to show website visitors how you’re creating value for your industry that can’t be found elsewhere. They want to see you have a thriving, engaged community: One of the top reasons people join membership organizations is to be part of a community of like-minded individuals. If you can show this on your website, you’re one step closer to getting a new member online. They want easy ways to pay or join online: Many older membership sites ask visitors to download, print, and mail in PDF membership forms. Unfortunately this slows down the registration process and actually creates holes that many potential members slip through (printer problems can stop someone from becoming a member). 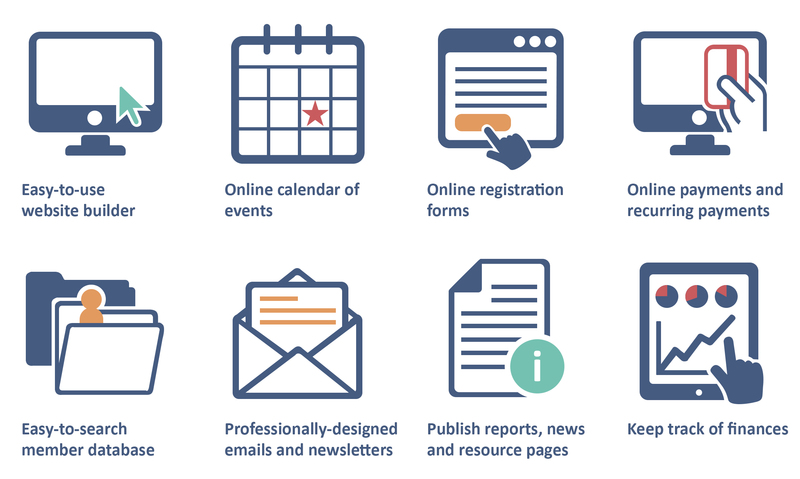 Offering online registration and payments for events can drastically increase your new member conversions, because the process is simple, quick, and people actually expect it. This is the first page your website visitors will land on, so think about what information you want them to see right away. 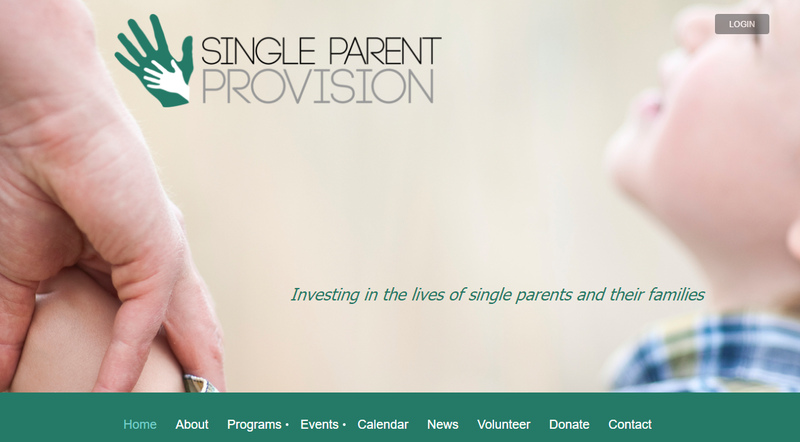 Many nonprofits put their main call to action on this page (like, “Join our organization”), along with news, featured members, upcoming events, and lots of pictures. 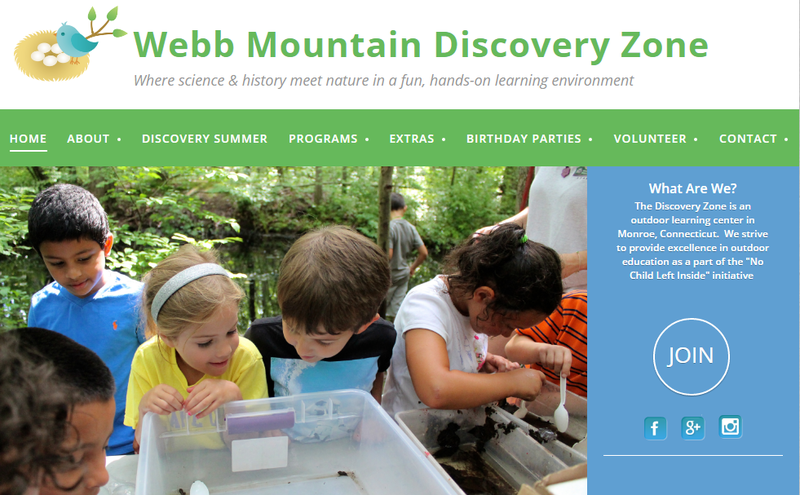 Here’s an example of a great Homepage from the Webb Mountain Discovery Zone. This page includes basic contact information for your organization. You can also choose to include a newsletter signup here that covers the benefits of receiving your monthly membership newsletter. The above eight pages will give you a great starting point to building your online presence and attracting new members online. If you’re looking for extra tips on how to design your website like the top nonprofits, I’ve written a full guide on the 22 features the top nonprofit websites have. There’s just one last step to get your organization’s current members connected through your website. Membership management softwares make it simple to upload your entire membership database in a matter of minutes, especially if your current database is in Excel. Below is a GIF showing how easy it is to import contacts using Wild Apricot as an example. After you import your contacts, the next step is to map out the matching fields from your contact database to Wild Apricot’s fields. This is fairly straight-forward, but if you get stuck, it’s easy to call Wild Apricot’s support and they can help you out (which is also free by the way). Now that all your contacts are uploaded into Wild Apricot, it’s a good idea to email them to let them know about your new website and that you’ll be accepting online payments now. Congratulations! That is the final step to complete your site. Now you can sit back and relax, the membership management software will help you keep an up-to-date website and take care of all your administrative work now: registering members, event attendees, processing payments, and updating member records. If you'd like to see how some organizations have built their websites using membership management software, I've included three examples below. You’ll be taken to a registration page where you can enter your account details. Once you click submit, you’ll activate a free 30-day trial of the paid version of Wild Apricot’s software. This means that you will have all the access to all the functionality that Wild Apricot's paid clients receive for 30 days. If at any point you need help with the system, feel free to get in touch with Wild Apricot's friendly support team. They’ll be more than happy to help you setup your account as quickly as possible. Best of success with your membership website!